Ideas for linking Degas’s pastel drawing Beach at low tide, (Plage à marée basse) with the work of other artists. Degas was a fan of the work of James McNeill Whistler (1843-1903) and Eugène Delacroix (1798-1863). He collected work by both of these artists. Look closely at all three artworks. Let’s imagine that Degas had seen these artworks by Delacroix and Whistler. What qualities and/or techniques might Degas have admired in these paintings? What similarities can you notice in the three different artworks? It is all very well to copy what one sees, but it is far better to draw what one now only sees in one’s memory. That is a transformation in which imagination collaborates with memory. Compare and contrast Beach at low tide, (Plage à marée basse) 1869 with Monet’s Rough weather at Étretat, (Gros Temps à Étretat) 1883. Think about the different ways the two artists worked and explore how these working methods have influenced the aesthetic qualities of the different artworks. What similarities and differences can you find? 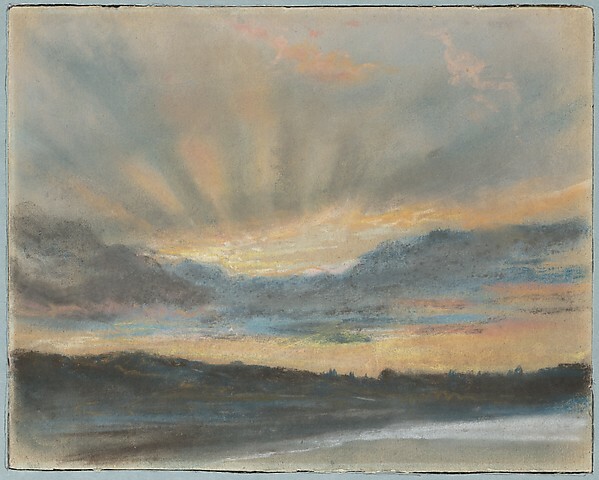 Compare Beach at low tide, (Plage à marée basse) 1869 with landscapes by Australian artist Fred Williams in the NGV Collection such as Lysterfield Landscape 1969 or After Bushfire (3) 1968. Notice how both artists have created a feel for the expanse of their landscapes. See how they have also used gestural abstract dots and dashes to create the forms and figures. Degas created a series of landscapes while holidaying in Beuzeval, on the Normandy coast in 1869.The pastel drawing Beach at low tide (Plage à marée basse) 1869 was completed during this holiday. Observe the dark rain heavy clouds approaching in the distance. See how Degas has allowed the brown paper to become part of his colour palette and how this is used at the shoreline as well as the foreground of this artwork. Notice the translucent quality of the water. Look at the way Degas has edited the figures and boats to just mere suggestions. Look at a range of photographs of landscapes. Also look at landscape paintings by artists other than Degas. These might include the following artworks by Eugène Delacroix, James McNeill Whistler and Fred Williams. Observe the characteristics of each artwork, such as placement of horizon line, application of paint, tonal qualities of the artworks and gestural marks to suggest form and figures. Using A5 brown craft paper, oil pastels and your memory create your own seascape or landscape pastel drawing. Think about the weather, season and time of day you would like to depict and select pastel colours accordingly. For example choose bright colours for warm days and cool harmonious colours for dull weather days. Apply the pastels lightly then use your finger to smudge these marks. Try to produce a translucent quality. Layer more colour over the marks you have already made. Use the warmth of the brown paper and allow it to seep through the colours by not applying the pastels too heavily over certain areas. Alternatively leave areas of the brown paper untouched. You may decide to add suggestions of figures, boats or animals in your scene in a manner similar to that of Degas. Use a dark colour to do this. Using the same process outlined above, but a different range of colours to create a new landscape from memory. Compare your landscape with the landscapes created by your classmates. Discuss with each other what makes an interesting landscape drawing. In Beach at low tide (Plage à marée base), Degas has captured a scene from his holiday Beuzeval, on the Normandy coast, in 1869. The act of painting in the landscape, or en plein air, would normally require a lot of tools and setup. Your papers or canvas, an easel, pastels or paints and most importantly good weather. Well, with your tablet you now only need to bring one thing (sorry, not even that fancy thing can control the weather for you…yet). Open the ArtRage app on your device. 2. Choose the Chalk Pastel brush. 3. That’s pretty much it, find an inspirational spot and pastel away! 4. You can use the Knife tool to smudge some of your pastel strokes to add more shape or form. Make sure to sign, and then share your creations with the world. Visit the exhibition page for Degas: A New Vision to learn more about the artist and exhibition themes, to view an interactive timeline, to see key works from the exhibition, and to download exhibition labels.